In about 30 minutes I am heading out for a long day at work. Rob will be taking the kids to his moms this afternoon. I should be home around 9 pm. But I wanted to tell everyone Happy Thanksgiving. 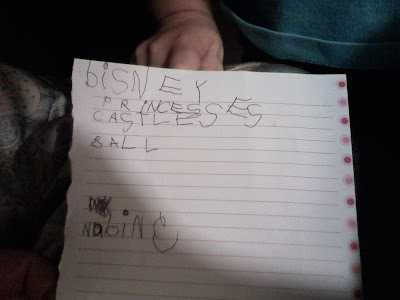 And I wanted to show you Nadine's first ever Christmas list. She wrote this last night for Santa and gave it to Grandpa. I had to tell her what letters to write. She did a fantastic job for 4 years old! I've been quite busy the last few days decorating the foyer at my church. I had lots of help from some of my ladies and after two straight days with what seemed like endless work - it's all done. Saturday I will be again back to decorating the auditorium. We couldn't do it this week because we have a wedding on Saturday afternoon. Here are some of the pics. This is the big tree that I posted about last week. Didn't it turn out beautiful??? This tree I had to add another row of lights since the bottom row is out - but it is our Ist Annual Hope Family Tree. Each regular attendee is being asked to bring an ornament with their name and 2008 on it. So it's bare right now but I'll post a picture when it is all covered. These trees are our Chrismon trees. All the ornaments on here were handmade by ladies of our church and in some way symbolize Christ. This is our forest area. It is still a work in progress. We now have an animated deer (not pictured) and we are awaiting one final tree that is being donated for the far corner. And this is Santa's chair. We have Breakfast with Santa every year. Santa comes and eats with the children, then reads them the true story of Christmas, the birth of Christ. It's really neat. And after all of this I have decided that I will decorate your tree if you hate decorating for a small fee. And also I have a camera and can take great family pictures with any of our displays, again for a small fee. So let me know! Nadine has been working really hard at school to prepare for their Thanksgiving feast. She's learned new songs, baked pumpkin bread, made stone soup and pecan bars. Oh, and we can't forget all the decorations that they had to make for the big day. She has been so excited! This morning she woke up asking if it was Friday. I said, yes and she went crazy! She knew exactly what she was going to wear. And was sure to not let any of us sleep because it's Thanksgiving Feast day! This year we have our new ministry center! So Christmas is very exciting! However, the church only has 6 and 7 foot trees and our foyer is about 30 feet tall or more. Now, Christmas is the one holiday that I go over the top! I'm dangerous in Christmas stores no matter what time of the year it is and I don't think I could ever have enough Christmas decorations. So you have to realize that in my humble opinion 6 and 7 ft. trees are not anywhere near big enough for a room that is as gigantic and open as our foyer at church. I have been searching and searching on Craiglist for a 12 ft. tree. We have these tile clouds in our foyer that make a faux ceiling at 14 ft. So one 12 ft. tree would definitely look proportionate in the foyer. And I somehow convinced the powers that be that the small trees we currently have would look ridiculous all alone in the foyer without some focal point. So I was given a budget to find a tree. Well I finally found one last week. Was on my way to get it when i received a phone call that what they thought was a 12 ft. tree has turned out to be only 9 ft, and my hopes were crushed. Which only made me search harder!!!! I got on ebay and found not a 12 footer but a 13 footer pre-lit. Now, this is where God was watching out for us, because not only did he find us a 13 foot pre-lit that's over 5 foot in diameter at the base...he found one with all the ornaments! And gave it to us at a steal of a deal! Today, Evalee and I took a ride together northeast of Cleveland, Ohio. It was a 2 and a half hour ride one way, but great time to catch up and visit together without the kids. (They didn't fit in the van because we had to take out all the rear seats.) And we picked up the fabulous tree! It's very crazy how excited I can become about a Christmas tree. But I was ready to hug the guy and give him a big kiss! But I refrained! I was told there were two boxes that were five feet long and big. However, one box was five feet long the other was about seven feet. It barely fit in my van. And it would have been quite hilarious to see Ev and I trying to get them into my van. I dropped Ev back at her house and headed up to church where Buckeye Bo helped me unload the tree (again another funny spectacle.) We didn't think to use the dollies that the church has! I absolutely cannot wait until Sunday to get the tree up!!!! 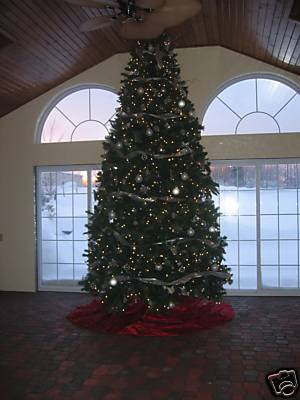 But here's the pic they advertised with on ebay, so you can at least get an idea of how monstrous this tree is!!! Today I was watching Cities of the Underworld. It was about Las Vegas. Well, Nadine kept asking me if it was gonna be scary because there were monsters in it. I just responded with "No there's no monsters in this." And she kept saying, "I know they said there was monsters, I know I heard it." Come to find out what she heard was "mobsters." We figured this out after about 15 minutes when they said the word mobsters. I then had to explain to her the difference between monsters and mobsters, which had I given her the long explanation there wouldn't of been much of a difference. A little later, she says "Mommy, I wanna watch mumbo. Let's watch mumbo." I was completely baffled. So I said, "What's mumbo?" She says, "The junior elephant." duh, (light bulb goes on) she meant "Dumbo!" So again I found myself explaining why his name was Dumbo and not Mumbo. Luckily she is learning her alphabet so it was easy to show her it starts with a "D" not an "M."
Rowan has a remote control car that Evalee gave him. Now he's never played with it because it's missing the battery and we haven't made it to Radio shack to buy a new one. But Rowan knows where it is and is constantly asking for it. Well, the other day he got his hands on the control for it. Rob took it away and put it on top of my china cabinet. Today, Rowan starts yelling to me that he wants his "troll." I'm thinking I don't have any naked wild-haired toys with a jewel in the belly around here, so what is he talking about. He wouldn't give up. So finally I said, "Show me." He takes me to the china cabinet and says "I want my troll, I want my troll, its up there." Of course, I'm short so I can't see it and frankily I'm wondering how my two year old knows it's there, because I know if I can't see, he can't either. But he's smart and he remembered where his daddy put it. So he has been running around today carrying his "troll" for the truck that he knows is in the garage because it needs batteries. He has also been searching my house for batteries. He knows where we keep them. So he shows them to me and says "Get my truck!" He doesn't understand it's not that kind of battery. He even took his batteries out of his flashlight for me to put in his truck. My friend, Kyle gave us some tickets to go see Battery: a Metallica Tribute Band on Friday night at The Omni (formerly Gatorz). So after a long week of Rowan being sick and whiny, we had a night out. We got a babysitter for the two young ones (Jourdyn is away at Fall Retreat with church). We took our friend Jason with us and Julie met us there. Metallica was huge when I was in Junior High and High school. I had many a friend that loved them and I did too! Rob commented when we got to the Omni (which is on a college campus) that you could tell how old the band playing is by the type of cars in the parking lot. About every other car was either a mini-van or an SUV. There were maybe a handful of college-aged kids there. The rest of us were overweight suburban has-beens out to relive our glory days with a tribute band! I believe at least one even brought their teenage son with them. Another way you could tell everyone there was old - at a Metallica concert back in the day, all these people you see standing around in the picture above, would have been in a mash pit, guys and girls headbanging and sitting on each others shoulders with the girls flashing the band. But no, they all just stood there watching. Saturday, we just stayed home all day. At about 4:30 Nadine comes running into the livingroom. "It's snowing! It's snowing!" She was very excited! Jumping up and down and screaming about it. Give her time, she'll grow to loath it, like most of us! Snow? In November? These flakes were huge probably at least an inch to an inch and a half in diameter. I took a picture but it's not the greatest. Rowan has been very ill since last Thursday. He's spiked fevers as high as 105 degrees and had a nasty cough. On Sunday, when his breathing became labored and his heart rate seemed to be going through the roof, I took him to the ER. About a month ago, Rowan had pneumonia and was treated for it and got better. I informed them of this, so they took a chest x-ray, which they said was clear and it wasn't pneumonia. Because his throat and tonsils were completely swollen and red as fire, they did a strep culture. And said it wasn't strep. They sent him home with a Z-pak and that was that. However, the way Z-pak's work, he should have been getting better almost immediately. He wasn't. Yesterday (Tuesday) I took him to our primary care. Who heard a rattle in his lungs but trusted what the ER said about his x-ray being clear. Figured out that they didn't take a strep culture appropriately, the nurse just stuck the swab in his completely dehydrated mouth, when she should have reached the back of his mouth to the throat where he would have gagged. And with his throat still remaining red and swollen after three days of the z-pak, he discovered that the z-pak was given in a dosage for a child half Rowan's size and is completely ineffective and perhaps only causing whatever this is to build immunity to it. So our Doctor doubled the dose for the final two days. We're not sure yet if it's working because he still spiked yesterday afternoon and over the night. I received a call today from the ER. And not only did they mess up the strep test, and the antibiotic but they also didn't see the pneumonia that is developed in his left lung. We have a call into our doctor to see what else needs to be done. Just pray that this is all resolved quickly because Rowan really hasn't ate in a week and we are battling to keep him hydrated and to keep fevers down. He's just miserable. Here comes an extremely honest post. And one that most probably wouldn't expect. In case you don't know or haven't realized it ever, my family is a paycheck to paycheck household. And most times we are left with more month to go at the end of our paycheck. The economy right now is in the crapper. I really feel that we are going into a depression, perhaps greater than the Great Depression. Rob's employer is shutting down for three weeks this holiday season, at least that the plan as of today. As you can imagine living paycheck to paycheck, this is going to seriously hurt our family. The only saving grace is that it happens to be one of the busiest times at my work and I will be able to at least put food on our table during those weeks and keep the heat and lights on. I had about a week ago typed out a post that I never posted. It was about Christmas and the economy and this year spending Christmas together with those you love, instead of buying gifts that aren't truly needed and feeling some obligation to buy for others when really you can't provide for your own family. I didn't post it. I should have, but I didn't. There isn't one of my friends or family that can this year really buy gifts for others without putting their own family in a pinch, well really not a pinch, a huge financial bind. I'm asking that my friends and family this year worry about their own family. I won't think that you don't love me or that you have forgotten my family. I want you to think about your family this season and do what's best for them. For Christmas this year, I want to spend time with my friends and family. Let's have a game night, or a movie night at one of our houses. Let's have dinner together. Let's just spend time together. That's the important part of Christmas, not the gifts. Somewhere along the line we have sold our souls to commericialism. I'm not talking about fancy lights and Santa. I'm talking about the incessant need to be constantly be buying more and more. We have somehow convinced ourselves that Christmas is about giving and getting gifts. And for years, I have bought into the idea, if I just give more and not worry about the getting that's good. But it's not. Not when, to give we forsake our own immediate families needs, like bills being paid, food being put on the table. Christmas is not about giving and getting gifts. It's about Jesus Christ coming into the world to offer us hope! Let's spread the hope of Christ through the gift of our time together building our relationships. and current armed forces personnel! I am truly grateful for your sacrifices! ~ Robert Schnase, Five Practices of Fruitful Congregations, 2007. My ministry has its roots in this very thought. I had never read Schnase before but I had figured out that I can complain all I want but until I am part of the solution I really have no right to complain. Over the past couple of years, I have had what I thought was personal struggles in my church and my ministry. I won't elaborate on them, read back in my blog and you see signs of them and some that I spoke about quite frankly, and still, there were many more that I kept to myself and bore alone. For what seemed the longest time, I believed it was something I was doing wrong. And most definitely, it was something only I was going through. This wasn't happening to other people serving. I believed it was exclusive to me. Recently, I have learned that it wasn't just me. That the things that I had experienced were indeed happening to the majority of the leaders and to many others as well. I felt as if I was being torn apart at the seams and in many ways now I am thankful I was not alone, even when I thought I was. Through all of this, I have learned that I have got to speak up. I have to, when things are wrong, call them wrong and when they are right, call them right. We are where we are today because so many of us bore our burdens and struggles alone, so we wouldn't stir up descent or cause problems. We internalized what should have been made public. And hindsight 20/20, our choice to remain silent was wrong. I should have spoken up and I should have not played into the game of manipulation through confidentially and denying spiritual growth to the very people I love and serve for Christ. "A church culture changes one person at a time." I want to be one of those "one person at a time." Where we go from here, is up to us. The choices we make will make or break this particular body of Christ. And we have got to make the right choices that build the community and encourage those that are part of it. And the first choice, is to no longer remain silent about anything. I am going to begin to as best as I am able tell people how I feel and what I see and what has happened to me. I figure I better give you all an update! Thursday night I spent at church with Robin, Doris and Sylvia making Chrismons. By the time Friday came Rowan was exhibiting the same symptoms that Nadine had had just about a week previous: extreme high fever and nasty cough. So he spent the weekend doped up on Tylenol and Motrin. I worked on Friday night for a Clambake party. It was actually pretty fun because after the party they had some comedians come. One of them was David Goodman. He was quite hilarious. Definitely an interactive comedian, you know, picking people out of the crowd to pick on. We were all laughing our butts off. Saturday, Rowan was still sick but active. So dad came over and we took the kids to see Madagascar 2. Rowan was so excited to go see it. When we got there he sat so nicely in his seat and then his fever spiked and he climbed up in my lap and fell asleep about half way through. Nadine loved it though. The movie was cute. Afterwards, I went to work again for the night and Rob kept the kids home. When I left for work Rowan's fever was at 104.5. We doubled dosed him on Tylenol and Motrin and it came down. Yesterday, was Sunday, I left all the kids home with Rob and headed off to church. Amy joined me for second service. And then I came home to find Rowan with a fever of 104.5 at 12:30 in the afternoon. Needless to say, I took him to the ER. He was getting a little dehydrated and his breathing just didn't seem right. They took a chest x-ray. It's not pheumonia again. A strep culture: It's not strep throat. However, his tonsils are bright red and swollen, as well as his whole throat. So they gave him an antibiotic and sent us home. His cough is loosening up, however, he spent the evening again with an extremely high fever. Yesterday, my friend Heather needed a sitter, so Nadine, Rowan and I made it a play date. We picked up Aiden and Lucius, grabbed some Mickey D's and headed for the park for a picnic. Afterwards, we all came back to our house to play outside together. Nadine and Rowan really loved having other kids to play with for the day and shared wonderfully! Rowan was in heaven having two other boys around to play cars, ride the tractor and climb up high on the playset. Take two brown or white paper lunch bags. Either works. Put them together and fold them in half, top to bottom. Then staple them on the middle seam. You now have a minature scrapbook and the best part is - it's dirt cheap. Then you pick out your pictures and cut them to fit. I just took colored papers for backgrounds, glued the pics to those and then glued them to each page of the lunchbag scrapbook. I also used some stickers for embelishments. I made the cover say "Fall Fun". I printed it on a piece of paper with leaf clipart and pasted it on to the cover. It turned out really cute and it took about 10-15 minutes to do! And the better news is that your kids can do it! It's that simple! 1) I'm learning that my political beliefs are less important than my effectiveness as a disciple for Christ, and even more ineffective when partnered with my calling to find the lost and missing. When I sign my name to the dotted line and partner a political agenda with my intent to serve Christ by loving and reaching all I can, then I not only sign up for the things that I find morally/politically right about a particular candidate but I also attach myself to things that perhaps I don't agree with and perhaps just aren't right. Does this mean I didn't vote? No, I voted. Does it mean that I don't give my opinion when asked? I think I did with grace in most cases or at least satire, because when we truly look at the Bible, it could be argued that there are arguments for both sides, that neither party is absolutely correct when it comes to morals/biblical values. But I honestly believe that it is more important for me to build bridges with those who do not know Christ and I've learned that in our current political climate, my putting signs in my yard, pins on my shirt, or stickers on my car for either candidate would have burnt many bridges and hinder my calling. So given all that...what you need to know is that today America has a new President-Elect - Barack Obama. Today, I have a new President-Elect, as do you. I am anxious to see what the Lord is going to do with Barack Obama. And there is one thing that I know for a fact we should all be doing. We should be praying for our new President-elect, Barack Obama and our VP-elect, Joe Biden. Up here in Ohio, our Board of Elections uses our schools as polling stations on voting days. So Jourdyn did not have school today! Instead, at our last parents meeting, I signed her and I up to stand at the polls for the school levy. This, of course, is something completely new for me. Having her in private schools for all these years, I didn't have to worry about volunteering for levy pushing. But I thought it would be a good exercise for Jourdyn to learn and participate in our wonderful representative republic that entitles us the right to vote. She had a first hand education in civic duties! And she hated it! Well, not exactly, she just thought it was boring, and I can't blame her. But we took along her friend Brooklyn and here are some pictures from our hour at the poll. Rowan even got in on the action. He also found a worm! Which, of course, was the highlight of the hour. He just had to show it to every person that walked in. have you ever wondered that? I've been praying and praying about where God wants me to be. And it seems that some days it is completely clear that I am supposed to be exactly where I am. But others, I feel like it's time to move on, like I'm not effective, appreciated, or wanted where I am. I am trying to be so faithful to stick things out. I'm not a normal person. Because of my position, my choices are being watched and my actions as well. And I believe this is why I have so much inner conflict going on with where I am supposed to be. I know what my calling is. I don't always have faith that I can fulfill it but I know what it is. I just don't know where God is taking me with it. And there are so many days that I just would love to walk away from a task that I know Jesus never claimed would be easy. As of late, I haven't literally wrote out a list but I have been mentally compiling a list of "pros and cons", or more appropriately a list of why's and why nots of staying put. On my "why list": the people that I love and appreciate and consider part of my family that I care so much about. I won't list my "why not to stay put list" but I can tell you that if I were to make my decision off of this "why not to stay put list"- I would have moved on about a year ago. "Discipleship is not limited to what you can comprehend--it must transcend all omprehension. Plunge deep into the deep waters beyond your own comprehension, and I will help you to comprehend even as I do. Bewilderment is the true comprehension. Not to know where you are going is the true knowledge. My comprehension transcends yours. Thus Abraham went forth from his father and not knowing whither he went. He trusted himself to my knowledge, and cared not for his own, and thus he took the right road and came to his journey's end. Behold, that is the way of the cross. You cannot find it yourself, so you must let me lead you as though you were a blind man. Wherefore it is not you, no man, no living creature, but I myself, who instruct you by my word and Spirit in the way you should go. Not the work which you choose, not the suffering you devise, but the road which is clean contrary to all that you choose and contrive or desire--that is the road you must take. To that I call you and in that you must be my disciple. If you do that, there is the acceptable time and there your master is come." As hard as it is to understand, my calling isn't about me. It's not about where I think I should be or what I think I should be doing, or if I'm living the best life or if I'm being praised at every turn or even if I'm being attacked for my actions or told that I'm not doing something right. It's not about me. It's about Him. It's about His message and about bringing the missing home to Him. That's where I need to find my peace - in Him, in the fact that I know that I am doing all that I am able to reach people for Christ, to be His disciple. And when my "why not list" outweighs my "why list" from my perspective, maybe from His perspective - the lists are reversed. And everything on my "why not to stay list" is on His "why you're there list." I know for sure that His plan is bigger than mine. That like Luther said, not knowing where I am going is true knowledge because Christ's comprehension transends mine. As His disciple I have to trust that He knows where He is taking me. There are just those days that I just really wish in my humanness that He would turn on the light at the end of the tunnel and let me just have a glimpse of what's ahead! Or in the very least, a sign of when enoughs enough.